More info:From £4349 - £4479 excluding flights. Optional single supplement £545. Mimimum age 16. The tiny Kingdom of Bhutan is culturally rich, remote and inaccessible. It’s also a wonderful place for a cycling holiday! Tucked away at the eastern end of the mighty Himalaya range, it has some good paved roads, wonderful mountain scenery and a fascinating history to explore as you pedal along. The whole country is united by its love of the King and in Bhutan, GNH (Gross National Happiness) is more important than GNP. 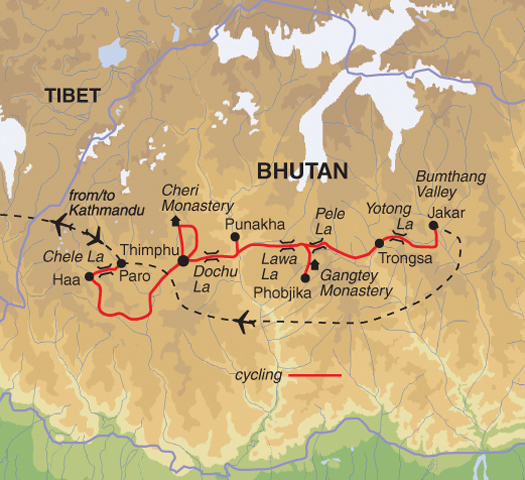 This is a new trip, starting in Paro in the west and finishing in the Bumthang Valley in central Bhutan. We visit the remote Haa Valley and the capital, Thimpu. Crossing several passes, we get wonderful views of the Himalaya, even glimpsing Gankar Punsum, which at 7,497m is the highest peak in Bhutan. A side trip to the beautiful Gangtey Valley and Punakha Dzong are added highlights, as is a visit to one of the masked dance festivals. There are plenty of long mountain climbs and exhilarating descents so a good level of cycling fitness is required. You’ll spend 9 days cycling (including one optional ride) on roads that are 75% Tarmac, 25% unpaved (some in poor condition), and with 100% vehicle support and a local guide. There are five passes at over 3,000m, but the gradients are mostly between 4% and 5%, so making it up is about riding slow and steady. Bhutan is a beautiful and special place to visit and travelling here is still in its infancy. The daily rate is expensive, but a large proportion of this goes to the government in the form of a tax which provides free education and health care for all Bhutanese people. Although this trip is largely focused on cycling and the stunning natural scenery on offer, we like to include as many elements of culture as possible, too. This tour has a large focus on celebrating the culture of Bhutan and, of course, local crafts and traditions come into this. We visit monasteries and workshops, for example the weaving center and handicraft school in Thimpu. Our tours benefit these small communities here as travellers purchase goods as souvenirs and often make donations. There is also the advantage of perpetuating these ancient ways of life and manners of producing goods. The most flamboyant display of culture we support on the trip is the Paro Festival, where hundreds gather to see monks dressed in colourful brocade and painted masks, re-enacting tales about gods with music and dance. Also by law, $70 of the daily cost of any trip in Bhutan goes towards education and health. Few holidays have as little detrimental impact on the environment and local residents as a cycling trip. Erosion on and adjacent to popular paths is a growing problem in certain places and therefore our trip leaders encourage clients to stick to advised routes in order to minimise this. We do believe in leaving no more than footprints (or tyre tracks! ), however, this tour does actively encourage clients to make a positive impact by helping guests to talk to local people, visit local cafes and restaurants, use markets to purchase traditional gifts and crafts and get a real impression of Bhutan.